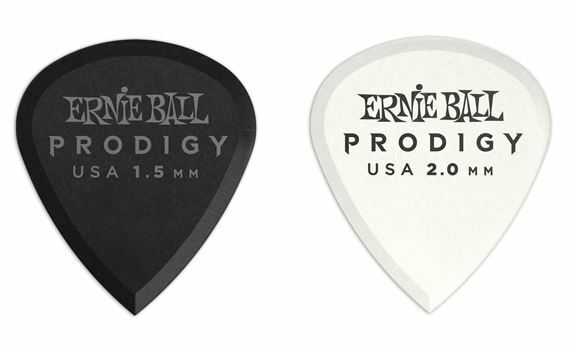 Order your Ernie Ball Prodigy Mini Guitar Picks from AMS and enjoy Fast & Free Shipping. Get the Best Deal with our Lowest Price Guarantee & Great Customer Service! Precise picking and great articulation were keys in the design of the Ernie Ball Prodigy Mini picks. Made of highly durable black Delrin material, these picks offer a more secure non-slip surface. The machined beveled edge and sharp point at bottom allow for less drag, added articulation, and precise control while playing. This pack contains 6 mini picks. These picks are “mini” and were even smaller than I expected. After strum some jazz bits for a few hours I took a liking to these. Then I switched gears and shredded with the picks and they are a nice change of pace to the Dunlop 3.0 picks I usually use. These won’t be for everyone....but they sure did the trick for me. I was sorely disappointed when these picks arrived. Don't be fooled by the photos. The actual picks are nowhere NEAR as sharp as what's depicted in the marketing photos. In fact, I wouldn't call them "sharp" at all. Ernie Ball is bordering on false advertising by posting all these ultra sharp-looking photos everywhere. The picks are beveled on the edges, yes, but they are NOT sharp. I asked AMS for a refund.